East Coast Throwdown started in the arcades of Chinatown and Long Island (along with Ryan Mead’s backyard). While we may have outgrown the party room of Castle Golf and the singular 3rd Strike cabinet of Chinatown Fair, we have always tried our best to stick to those roots. That is why we are elated to announce the Red Bull Arcade Presented by Red Bull Battlegrounds! This arcade will be open for the entire event, 24 hours, starting on Saturday. We are excited to partner with Tony Majors and the Travelling Controller, who will be offering an extensive and diverse group of arcade games and consoles for everyone’s enjoyment. We look forward to seeing everyone playing in the bright glow of the Red Bull Arcade at East Coast Throwdown 2017, Register Today. Red Bull has been active in its support and improvement of the Fighting Game Community since it first stepped on the scene. The Red Bull Arcade will have arcade cabinets—courtesy of Tony Majors—containing some of the best classic fighting games for everyone’s enjoyment. It also will have a BYOC console section where players will be able to play against one another and make friends in the latest console fighters. Access to the Red Bull Arcade is included with your ECT 2017 Competitor or Spectator badge which you can get here. We look forward to seeing everyone playing in the bright glow of the Red Bull Arcade at East Coast Throwdown 2017! 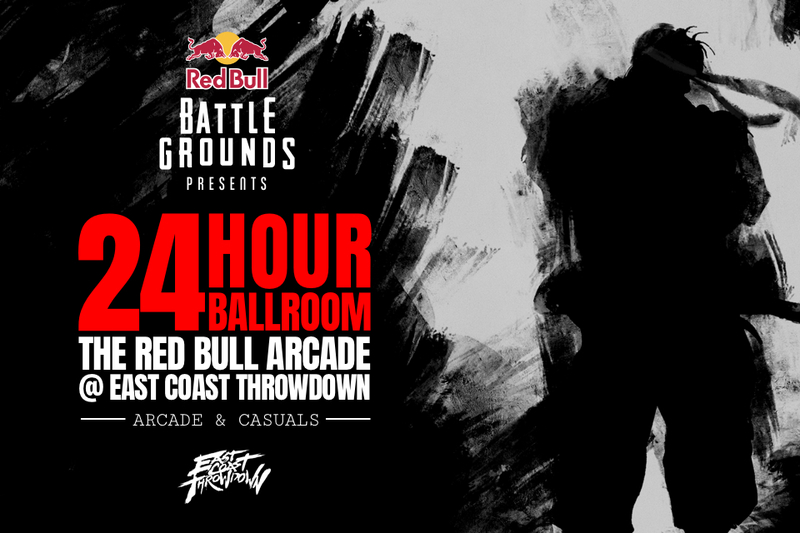 The 24-hour arcade is possible thanks to Red Bull Battle Grounds. Red Bull Battle Grounds will serve as the Capcom Pro Tour North America Regional Finals taking place over two days, Nov. 18 & 19 in Boston, Massachusetts, at the Castle at Park Plaza. Players from all over North America on Day one will compete in a 512-player last-chance qualifier to win the final spot in the eight-player bracket on Sunday. On Sunday the top seven players in the Capcom Pro Tour North America leaderboards + the winner of the last chance qualifier, will duke it out for the title of best Street Fighter V player in North America. Aside from serving as regional final for Capcom Pro Tour North America, Red Bull Battle Grounds will also be a celebration of the 30th anniversary of Street Fighter. So not only will you have to compete in Street Fighter V, but there will also be events for Ultra Street Fighter 4, Street Fighter 3: Third Strike, Super Street Fighter 2 Turbo and more. So if you are a huge fan of Street FIghter you will not want to miss out on Red Bull Battle Grounds. For more information on Red Bull Battle Grounds click here.